Space Shuttle Discovery launches at the start of STS-120. The Space Shuttle, or Space Transportation System (STS), is a reusable launch system and orbital spacecraft operated by the U.S. National Aeronautics and Space Administration (NASA) for human spaceflight missions. The system combines rocket launch, orbital spacecraft, and re-entry spaceplane with modular add-ons. The first of four orbital test flights occurred in 1981 leading to operational flights beginning in 1982. The system is scheduled to be retired from service in 2011 after 135 launches. Major missions have included launching numerous satellites and interplanetary probes, conducting space science experiments, and servicing and construction of space stations. It has been used for orbital space missions by NASA, the U.S. Department of Defense, the European Space Agency, Japan, and Germany. 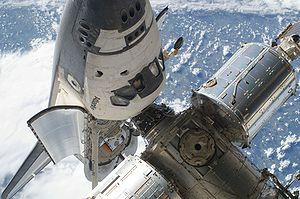 The United States funded STS development and shuttle operations except for Spacelab D1 and D2 - sponsored by West Germany and reunified Germany respectively. In addition, SL-J was partially funded by Japan. At launch, the Space Shuttle consists of the shuttle stack, which includes a dark orange-colored external tank (ET); two white, slender Solid Rocket Boosters (SRBs); and the Orbiter Vehicle (OV), which contains the crew and payload. Payloads can be launched into higher orbits with either of two different booster stages developed for the STS (single-stage Payload Assist Module or two-stage Inertial Upper Stage). The Space Shuttle is "stacked" in the Vehicle Assembly Building and the stack mounted on a mobile launch platform held down by four explosive bolts on each SRB which are detonated at launch. The shuttle stack launches vertically, like a conventional rocket, from a mobile launch platform. It lifts off under the power of its two SRBs and the three main engines, which are fueled by liquid hydrogen and liquid oxygen from the external tank. The Space Shuttle has a two-stage ascent. The SRBs provide additional thrust during liftoff and first-stage flight. About two minutes after liftoff, explosive bolts are fired, releasing the SRBs, which then parachute into the ocean, to be retrieved by ships for refurbishment and reuse. The shuttle orbiter and external tank continue to ascend on an increasingly horizontal flight path under power from the three main engines. Upon reaching 17,500 mph (7.8 km/s), necessary for low Earth orbit, the main engines are shut down. The external tank is then jettisoned downward to burn up in the atmosphere. It is, however, possible for the external tank to be re-used in orbit. After jettisoning the external tank, the orbital maneuvering system (OMS) engines may be used to adjust the orbit. The orbiter carries astronauts and payload such as satellites or space station parts into low earth orbit, into the Earth's upper atmosphere or thermosphere. Usually, five to seven crew members ride in the orbiter. Two crew members, the Commander and Pilot, are sufficient for a minimal flight, as in the first four "test" flights, STS-1 through STS-4. A typical payload capacity is about 22,700 kilograms (50,000 lb), but can be raised depending on the choice of launch configuration. The orbiter carries the payload in a large cargo bay with doors that open along the length of its top, a feature which makes the Space Shuttle unique among present spacecraft. This feature made possible the deployment of large satellites such as the Hubble Space Telescope, and also to capture and return large payloads back to Earth. When the orbiter's space mission is complete, it fires its OMS thrusters to drop out of orbit and re-enter the lower atmosphere. During the descent, the shuttle orbiter passes through different layers of the atmosphere and decelerates from hypersonic speed primarily by aerobraking. In the lower atmosphere and landing phase, it is more like a glider but with reaction control system (RCS) thrusters and fly-by wire controlled hydraulically actuated flight surfaces controlling its descent. It then makes a landing on a long runway as a spaceplane. The aerodynamic shape is a compromise between the demands of radically different speeds and air pressures during re-entry, hypersonic flight, and subsonic atmospheric flight. As a result, the orbiter has a relatively high sink rate at low altitudes, and transitions during re-entry from using RCS thrusters in low pressure to flight surfaces at low altitudes. Though design and construction of the Space Shuttle began in the early 1970s, conceptualization actually began two decades earlier, even before the Apollo program of the 1960s. The concept of a spacecraft returning from space to a horizontal landing began within NACA, in 1954, in the form of an aeronautics research experiment later named the X-15. The NACA proposal was submitted by Walter Dornberger. In 1958, the X-15 concept further developed into another X-series spaceplane proposal, called the X-20, which was never constructed. 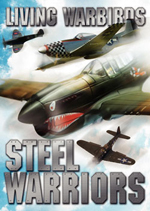 Neil Armstrong was selected to pilot both the X-15 and the X-20. Though the X-20 was never built, another spaceplane similar to the X-20 was built several years later and delivered to NASA in January 1966. It was called the HL-10. "HL" indicated "horizontal landing". In the mid-1960s, the US Air Force conducted a series of classified studies on next-generation space transportation systems and concluded that semi-reusable designs were the cheapest choice. They proposed a development program with an immediate start on a "Class I" vehicle with expendable boosters, followed by slower development of a "Class II" semi-reusable design and perhaps a "Class III" fully reusable design later. In 1967 George Mueller held a one-day symposium at NASA headquarters to study the options. Eighty people attended and presented a wide variety of designs, including earlier Air Force designs as the Dyna-Soar (X-20). In 1968, NASA officially began work on what was then known as the "Integrated Launch and Re-entry Vehicle" (ILRV). At the same time, NASA held a separate Space Shuttle Main Engine (SSME) competition. NASA offices in Houston and Huntsville jointly issued a Request for Proposal (RFP) for ILRV studies to design a spacecraft that could deliver a payload to orbit but also re-enter the atmosphere and fly back to Earth. One of the responses was for a two-stage design, featuring a large booster and a small orbiter, called the DC-3. In 1969, President Richard Nixon decided to proceed with Space Shuttle development. In August 1973, the X-24B proved that an unpowered spaceplane could re-enter Earth's atmosphere for a horizontal landing. The Space Shuttle is the first orbital spacecraft designed for reuse. It carries different payloads to low Earth orbit, provides crew rotation for the International Space Station (ISS), and performs servicing missions. The orbiter can also recover satellites and other payloads from orbit and return them to Earth. 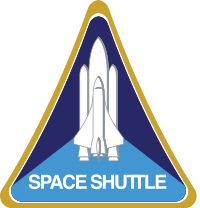 Each Shuttle was designed for a projected lifespan of 100 launches or ten years of operational life, although this was later extended. The person in charge of designing the STS was Maxime Faget, who had also overseen the Mercury, Gemini, and Apollo spacecraft designs. The crucial factor in the size and shape of the Shuttle Orbiter was the requirement that it be able to accommodate the largest planned commercial and classified satellites, and have the cross-range recovery range to meet the requirement for classified USAF missions for a once-around abort from a launch to a polar orbit. Factors involved in opting for solid rockets and an expendable fuel tank included the desire of the Pentagon to obtain a high-capacity payload vehicle for satellite deployment, and the desire of the Nixon administration to reduce the costs of space exploration by developing a spacecraft with reusable components. Each Space Shuttle is a reusable launch system that is composed of three main assemblies: the reusable Orbiter Vehicle (OV), the expendable external tank (ET), and the two reusable solid rocket boosters (SRBs). Only the orbiter enters orbit shortly after the tank and boosters are jettisoned. The vehicle is launched vertically like a conventional rocket, and the orbiter glides to a horizontal landing like an airplane, after which it is refurbished for reuse. The SRBs parachute to splashdown in the ocean where they are towed back to shore and refurbished for later shuttle missions. Six airworthy orbiters have been built; the first, Enterprise (OV-101), was not built for orbital space flight, and was used only for testing glide and landing. Five space-worthy orbiters were built: Columbia (OV-102), Challenger (OV-099), Discovery (OV-103), Atlantis (OV-104), and Endeavour (OV-105). Enterprise was originally intended to be made fully space-worthy after use for the approach and landing test (ALT) program, but it was found more economical to upgrade the structural test article STA-099 into orbiter Challenger (OV-099). 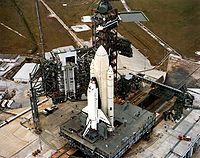 Challenger disintegrated 73 seconds after launch in 1986, and Endeavour was built as a replacement for Challenger from structural spare components. Columbia broke apart during re-entry in 2003. Building Space Shuttle Endeavour cost about US$1.7 billion. One Space Shuttle launch costs around $450 million. Roger A. Pielke, Jr. has estimated that the Space Shuttle program has cost about US$170 billion (2008 dollars) through early 2008. This works out to an average cost per flight of about US$1.5 billion. However, two missions were paid for by Germany, Spacelab D1 and D2 (D for Deutschland) with a payload control center in Oberpfaffenhofen, Germany. D1 was the first time that control of a manned STS mission payload was not in U.S. hands. At times, the orbiter itself is referred to as the Space Shuttle. Technically, this is a slight misnomer, as the actual "Space Transportation System" (Space Shuttle) is the combination of the orbiter, the external tank, and the two solid rocket boosters. Combined, these are referred to as the "Stack"; the components are assembled in the Vehicle Assembly Building, which was originally built to assemble the Apollo Saturn V rocket stacks. Water is released onto the mobile launcher platform on Launch Pad 39A at the start of a sound suppression system test in 2004. During launch, 300,000 US gallons (1,100 m�) are poured onto the pad in only 41 seconds. The orbiter resembles a conventional aircraft, with double-delta wings swept 81� at the inner leading edge and 45� at the outer leading edge. 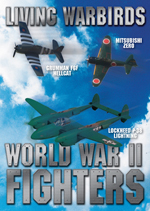 Its vertical stabilizer's leading edge is swept back at a 50� angle. The four elevons, mounted at the trailing edge of the wings, and the rudder/speed brake, attached at the trailing edge of the stabilizer, with the body flap, control the orbiter during descent and landing. Three Space Shuttle main engines (SSMEs) are mounted on the orbiter's aft fuselage in a triangular pattern. The three engine nozzles can swivel 10.5 degrees up and down, and 8.5 degrees from side to side during ascent to change the direction of their thrust to steer the shuttle. The orbiter structure is made primarily from aluminum alloy, although the engine structure is made primarily from titanium alloy. The space-capable orbiters built are OV-102 Columbia, OV-099 Challenger, OV-103 Discovery, OV-104 Atlantis, and OV-105 Endeavour. The main function of the Space Shuttle external tank is to supply the liquid oxygen and hydrogen fuel to the Space Shuttle main engines. It is also the backbone of the launch vehicle providing attachment points for the two Solid Rocket Boosters and the Orbiter. The external tank is the only part of the shuttle system that is not reused. Although the external tanks have always been discarded, it is possible to take them into orbit and re-use them (such as for incorporation into a space station). Two solid rocket boosters (SRBs) each provide 12.5 million newtons (2.8 million lbf) of thrust at liftoff, which is 83% of the total thrust needed for liftoff. The SRBs are jettisoned two minutes after launch at a height of about 150,000 feet (46 km), and then deploy parachutes and land in the ocean to be recovered. The SRB cases are made of steel about � inch (13 mm) thick. The Solid Rocket Boosters are re-used many times; the casing used in Ares I engine testing in 2009 consisted of motor cases that have been flown, collectively, on 48 shuttle missions, including STS-1. Picture - Atlantis deploys the landing gear before landing on a selected runway just like a common aircraft. Picture - During STS-101, Atlantis was the first shuttle to fly with a glass cockpit. The Space Shuttle was initially developed in the 1970s-era but has received many upgrades and modifications since then for improvements ranging from performance and reliability to safety. Internally, the shuttle remains largely similar to the original design, with the exception of the improved avionics computers. In addition to the computer upgrades, the original analog primary flight instruments were replaced with modern full-color, flat-panel display screens, similar to those of contemporary airliners like the Airbus A380 and Boeing 777. This is called a glass cockpit. With the coming of the ISS, the orbiter's internal airlocks have been replaced with external docking systems to allow for a greater amount of cargo to be stored on the shuttle's mid-deck during station resupply missions. For the first two missions, STS-1 and STS-2, the external tank was painted white to protect the insulation that covers much of the tank, but improvements and testing showed that it was not required. The weight saved by not painting the tank results in an increase in payload capability to orbit. Additional weight was saved by removing some of the internal "stringers" in the hydrogen tank that proved unnecessary. The resulting "light-weight external tank" has been used on the vast majority of shuttle missions. STS-91 saw the first flight of the "super light-weight external tank". This version of the tank is made of the 2195 aluminum-lithium alloy. It weighs 3.4 metric tons (7,500 lb) less than the last run of lightweight tanks. As the shuttle cannot fly unmanned, each of these improvements has been "tested" on operational flights. Picture - The three nozzles of the Main Engine cluster with the two Orbital Maneuvering System (OMS) pods, and the vertical stabilizer above. On the first four shuttle missions, astronauts wore modified U.S. Air Force high-altitude full-pressure suits, which included a full-pressure helmet during ascent and descent. From the fifth flight, STS-5, until the loss of Challenger, one-piece light blue nomex flight suits and partial-pressure helmets were worn. A less-bulky, partial-pressure version of the high-altitude pressure suits with a helmet was reinstated when shuttle flights resumed in 1988. The Launch-Entry Suit ended its service life in late 1995, and was replaced by the full-pressure Advanced Crew Escape Suit (ACES), which resembles the Gemini space suit in design, but retains the orange color connected to the Launch-Entry Suit. Picture - Space Shuttle Orbiter and Soyuz-TM (drawn to scale). 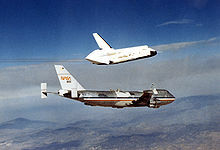 The earliest shuttle flights had the minimum crew of two; many later missions a crew of five. Today, typically seven people fly (commander, pilot, several mission specialists, and rarely a flight engineer). On two occasions, eight astronauts have flown (STS-61-A, STS-71). Eleven people could be accommodated in an emergency mission (see STS-3xx). All Space Shuttle missions are launched from Kennedy Space Center (KSC). The weather criteria used for launch include, but are not limited to: precipitation, temperatures, cloud cover, lightning forecast, wind, and humidity. 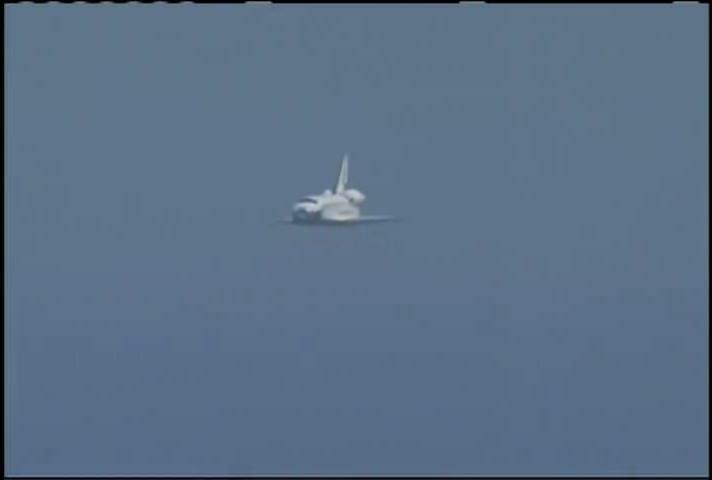 The shuttle will not be launched under conditions where it could be struck by lightning. Aircraft are often struck by lightning with no adverse effects because the electricity of the strike is dissipated through its conductive structure and the aircraft is not electrically grounded. Like most jet airliners, the shuttle is mainly constructed of conductive aluminum, which would normally shield and protect the internal systems. 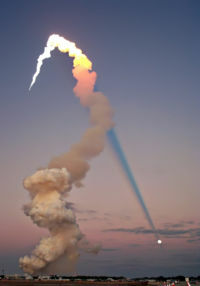 However, upon takeoff the shuttle sends out a long exhaust plume as it ascends, and this plume can trigger lightning by providing a current path to ground. The NASA Anvil Rule for a shuttle launch states that an anvil cloud cannot appear within a distance of 10 nautical miles. The Shuttle Launch Weather Officer will monitor conditions until the final decision to scrub a launch is announced. In addition, the weather conditions must be acceptable at one of the Transatlantic Abort Landing sites (one of several Space Shuttle abort modes) to launch as well as the solid rocket booster recovery area. While the shuttle might safely endure a lightning strike, a similar strike caused problems on Apollo 12, so for safety NASA chooses not to launch the shuttle if lightning is possible (NPR8715.5). Picture - Two Space Shuttles sit at launch pads. This particular occasion is due to the final Hubble servicing mission, where the International Space Station is unreachable, which necessitates having a Shuttle on standby for a possible rescue mission. At T minus 16 seconds, the massive sound suppression system (SPS) begins to drench the Mobile Launcher Platform (MLP) and SRB trenches with 300,000 US gallons (1,100 m) of water to protect the Orbiter from damage by acoustical energy and rocket exhaust reflected from the flame trench and MLP during liftoff. Picture - Shuttle launch of Atlantis at sunset in 2001. The sun is behind the camera, and the plume's shadow intersects the moon across the sky. The three Space Shuttle Main Engines (SSMEs) start at T minus 6.6 seconds. 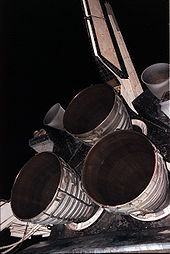 The main engines ignite sequentially via the shuttle's general purpose computers (GPCs) at 120 millisecond intervals. The GPCs require that the engines reach 90% of their rated performance to complete the final gimbal of the main engine nozzles to liftoff configuration. When the SSMEs start, the water from the sound suppression system flashes into a large volume of steam that shoots southward. All three SSMEs must reach the required 100% thrust within three seconds, otherwise the onboard computers will initiate an RSLS abort. If the onboard computers verify normal thrust buildup, at T minus 0 seconds, the 8 pyrotechnic nuts holding the vehicle to the pad are detonated and the SRBs are ignited. At this point the vehicle is committed to takeoff, as the SRBs cannot be turned off once ignited. The plume from the solid rockets exits the flame trench in a northward direction at near the speed of sound, often causing a rippling of shockwaves along the actual flame and smoke contrails. At ignition, the GPCs mandate the firing sequences via the Master Events Controller, a computer program integrated with the shuttle's four redundant computer systems. There are extensive emergency procedures (abort modes) to handle various failure scenarios during ascent. Many of these concern SSME failures, since that is the most complex and highly stressed component. After the Challenger disaster, there were extensive upgrades to the abort modes. After the main engines start, but while the solid rocket boosters are still clamped to the pad, the offset thrust from the Shuttle's three main engines causes the entire launch stack (boosters, tank and shuttle) to pitch down about 2 m at cockpit level. This motion is called the "nod", or "twang" in NASA jargon. As the boosters flex back into their original shape, the launch stack pitches slowly back upright. This takes approximately six seconds. At the point when it is perfectly vertical, the boosters ignite and the launch commences. The Johnson Space Center's Mission Control Center assumes control of the flight once the SRBs have cleared the launch tower. Shortly after clearing the tower the Shuttle begins a combined roll, pitch and yaw maneuver that positions the orbiter head down, with wings level and aligned with the launch pad. The Shuttle flies upside down during the ascent phase. This orientation allows a trim angle of attack that is favorable for aerodynamic loads during the region of high dynamic pressure, resulting in a net positive load factor, as well as providing the flight crew with use of the ground as a visual reference. The vehicle climbs in a progressively flattening arc, accelerating as the weight of the SRBs and main tank decrease. To achieve low orbit requires much more horizontal than vertical acceleration. This is not visually obvious, since the vehicle rises vertically and is out of sight for most of the horizontal acceleration. The near circular orbital velocity at the 380 kilometers (236 mi) altitude of the International Space Station is 7.68 kilometers per second 27,650 km/h (17,180 mph), roughly equivalent to Mach 23 at sea level. As the International Space Station orbits at an inclination of 51.6 degrees, the Shuttle has to set its inclination to the same value to rendezvous with the station. Picture - SSLV at Mach 2.46 and 66,000 ft (20,000 m). The surface of the vehicle is colored by the pressure coefficient, and the gray contours represent the density of the surrounding air, as calculated using the overflow codes. Around a point called Max Q, where the aerodynamic forces are at their maximum, the main engines are temporarily throttled back to 72% to avoid overspeeding and hence overstressing the Shuttle, particularly in vulnerable areas such as the wings. At this point, a phenomenon known as the Prandtl-Glauert singularity occurs, where condensation clouds form during the vehicle's transition to supersonic speed. At T+70 seconds, the main engines throttle up to their maximum cruise thrust of 104% rated thrust. At T+126 seconds after launch, explosive bolts release the SRBs and small separation rockets push them laterally away from the vehicle. The SRBs parachute back to the ocean to be reused. The Shuttle then begins accelerating to orbit on the Space Shuttle main engines. The vehicle at that point in the flight has a thrust-to-weight ratio of less than one - the main engines actually have insufficient thrust to exceed the force of gravity, and the vertical speed given to it by the SRBs temporarily decreases. However, as the burn continues, the weight of the propellant decreases and the thrust-to-weight ratio exceeds 1 again and the ever-lighter vehicle then continues to accelerate towards orbit. The vehicle continues to climb and takes on a somewhat nose-up angle to the horizon - it uses the main engines to gain and then maintain altitude while it accelerates horizontally towards orbit. At about five and three-quarter minutes into ascent, the orbiter's direct communication links with the ground begin to fade, at which point it rolls heads up to reroute its communication links to the Tracking and Data Relay Satellite system. Finally, in the last tens of seconds of the main engine burn, the mass of the vehicle is low enough that the engines must be throttled back to limit vehicle acceleration to 3 g (29.34 m/s�), largely for astronaut comfort. Almost the entire Space Shuttle re-entry procedure, except for lowering the landing gear and deploying the air data probes, is normally performed under computer control. However, the re-entry can be flown entirely manually if an emergency arises. The approach and landing phase can be controlled by the autopilot, but is usually hand flown. The vehicle begins re-entry by firing the Orbital maneuvering system engines, while flying upside down, backside first, in the opposite direction to orbital motion for approximately three minutes, which reduces the shuttle's velocity by about 200 mph (322 km/h). The resultant slowing of the Shuttle lowers its orbital perigee down into the upper atmosphere. The shuttle then flips over, by pushing its nose down (which is actually "up" relative to the Earth, because it is flying upside down). This OMS firing is done roughly halfway around the globe from the landing site. The vehicle starts encountering more significant air density in the lower thermosphere at about 400,000 ft (120 km), at around Mach 25, 8,200 m/s (30,000 km/h; 18,000 mph). The vehicle is controlled by a combination of RCS thrusters and control surfaces, to fly at a 40 degree nose-up attitude, producing high drag, not only to slow it down to landing speed, but also to reduce reentry heating. As the vehicle encounters progressively denser air, it begins a gradual transition from spacecraft to aircraft. 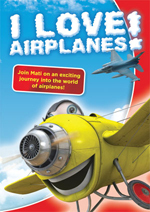 In a straight line, its 40 degree nose-up attitude would cause the descent angle to flatten-out, or even rise. The vehicle therefore performs a series of four steep S-shaped banking turns, each lasting several minutes, at up to 70 degrees of bank, while still maintaining the 40 degree angle of attack. In this way it dissipates speed sideways rather than upwards. This occurs during the 'hottest' phase of re-entry, when the heat-shield glows red and the G-forces are at their highest. By the end of the last turn, the transition to aircraft is almost complete. The vehicle levels its wings, lowers its nose into a shallow dive and begins its approach to the landing site. Simulation of the outside of the Shuttle as it heats up to over 1,500 �C during re-entry. In the lower atmosphere, the orbiter flies much like a conventional glider, except for a much higher descent rate, over 50 m/s (180 km/h; 110 mph). At approximately Mach 3, two air data probes, located on the left and right sides of the orbiter's forward lower fuselage, are deployed to sense air pressure related to the vehicle's movement in the atmosphere. When the approach and landing phase begins, the orbiter is at a 3,000 m (9,800 ft) altitude, 12 km (7.5 mi) from the runway. The pilots apply aerodynamic braking to help slow down the vehicle. The orbiter's speed is reduced from 682 to 346 km/h (424 to 215 mph), approximately, at touch-down (compared to 260 km/h (160 mph) for a jet airliner). The landing gear is deployed while the Orbiter is flying at 430 km/h (270 mph). To assist the speed brakes, a 12 m (39 ft) drag chute is deployed either after main gear or nose gear touchdown (depending on selected chute deploy mode) at about 343 km/h (213 mph). The chute is jettisoned once the orbiter slows to 110 km/h (68.4 mph). Discovery touches down at the end of STS-95. Columbia lands at Kennedy Space Center at the end of STS-73. NASA prefers Space Shuttle landings to be at Kennedy Space Center. If weather conditions make landing there unfavorable, the shuttle can delay its landing until conditions are favorable, touch down at Edwards Air Force Base, California, or use one of the multiple alternate landing sites around the world. A landing at any site other than Kennedy Space Center means that after touchdown the shuttle must be mated to the Shuttle Carrier Aircraft and returned to Cape Canaveral. 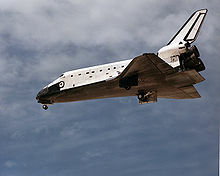 Space Shuttle Columbia (STS-3) landed at the White Sands Space Harbor, New Mexico; this is viewed as a last resort as NASA scientists believe that the sand could potentially damage the shuttle's exterior. Picture - OV-101 Enterprise takes flight for the first time over Dryden Flight Research Facility, Edwards, California in 1977 as part of the Shuttle program's Approach and Landing Tests (ALT). On January 28, 1986, Space Shuttle Challenger disintegrated 73 seconds after launch due to the failure of the right SRB, killing all seven astronauts on board. The disaster was caused by low-temperature impairment of an SRB O-ring, a mission critical component. Repeated warnings from design engineers voicing concerns about the lack of evidence of the O-rings' safety when the temperature was below 53 �F (12 �C) were ignored by NASA managers. On February 1, 2003, Space Shuttle Columbia disintegrated during re-entry, killing its crew of seven, because of damage to the carbon-carbon leading edge of the wing caused during launch. Ground control engineers had made three separate requests for high-resolution images taken by the Department of Defense that would have provided an understanding of the extent of the damage, while NASA's chief thermal protection system (TPS) engineer requested that astronauts on board the Columbia be allowed to leave the vehicle to inspect the damage. NASA managers intervened to stop the Department of Defense's assistance and refused the request for the spacewalk, and thus the feasibility of scenarios for astronaut repair or rescue by the Space Shuttle Atlantis were not considered by NASA management at the time. Picture - Space Shuttle Atlantis lifts off from Launch Pad 39A at NASA's Kennedy Space Center in Florida on the STS-132 mission to the International Space Station at 2:20 p.m. EDT on May 14. The last scheduled flight of Atlantis before it is retired. 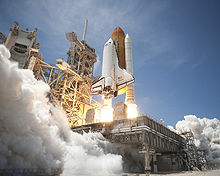 NASA's current plans call for the Space Shuttle to be retired from service in 2011, after nearly 30 years of service. Under the current plans, Atlantis will be the first of NASA's three remaining operational Space Shuttles to be retired as the program winds down. To fill the void left by the Shuttle's retirement, a new spacecraft is being developed to ferry not only passengers and cargo to the ISS but also to travel beyond Earth orbit to the Moon and Mars. Originally called the Crew Exploration Vehicle, the concept has evolved into the Orion spacecraft and the project named Project Constellation. President Obama's administration in Feb 2010 proposed eliminating public funds for the Constellation program and shifting the burden for developing a replacement low-orbit service to private corporations. Until another launch vehicle is ready, crews would travel to and from the International Space Station aboard Russian Soyuz spacecraft or possibly a future American commercial spacecraft. However, President Obama's plan must be approved by the United States Congress, and counter-proposals are currently being considered by Congress, including the potential extension of the Space Shuttle program for an additional five years while a replacement can be developed. The proposed cancellation of Project Constellation in February 2010 was signed into law October 11, 2010. Flight and mid-deck training hardware from the Johnson Spaceflight Center will go to the National Air and Space Museum and the National Museum of the U.S. Air Force. 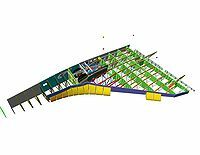 The full fuselage mockup, which includes the payload bay and aft section but no wings, is to go to the Museum of Flight in Seattle, which has already broken ground on its new building to house the artifact. Mission Simulation and Training Facility's fixed simulator will go to the Adler Planetarium in Chicago, and the motion simulator will go to Texas A&M's Aerospace Engineering Department in College Station, Texas. 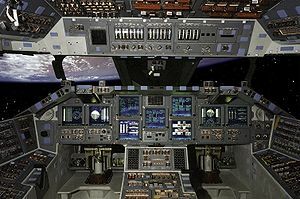 Other simulators used in shuttle astronaut training will go to the Wings of Dreams Aviation Museum in Starke, Florida and the Virginia Air and Space Center in Hampton, Virginia. 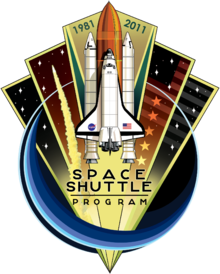 NASA is also donating Space Shuttle thermal protection system tiles to schools and universities for $23.40 each. About 7,000 tiles are available on a first-come, first-served basis, but limited to one each per institution. Shuttle-Derived Launch Vehicles, including Heavy Lift Launch Vehicles, have been proposed. For example, designs for the Ares I and Ares V have been integrated into meeting those challenges set forth within the Vision for Space Exploration; though the Constellation program was discontinued in October 2010. The USAF's Boeing X-37 program represents a next-generation of unmanned reusable spaceplanes. The X-37 reuses the basic aerodynamic lifting body shape of the Space Shuttle Orbiter. According to Deputy Under Secretary of the Air Force (International Affairs) Gary Payton, the X-37 is a "test" for the next-generation beyond the Space Shuttle, designed to remain in orbit for up to 9 months at a time. The Space Shuttle has played an important role in various works of fiction. Early examples include the 1979 James Bond film, Moonraker where shuttles played a major role well before any were actually launched, Activision videogame Space Shuttle: A Journey into Space (1982) and G. Harry Stine's novel Shuttle Down (1981). In the 1986 family film SpaceCamp, the Atlantis accidentally launches into space with children as its crew. Retired American test pilots visit a Russian satellite in the Clint Eastwood adventure film Space Cowboys (2000). On television, the 1996 drama The Cape portrays the lives of a group of NASA astronauts as they prepare for and fly shuttle missions. 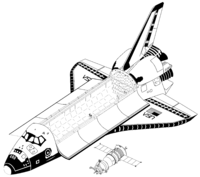 The Space Shuttle has also been the subject of toys and models, for example a large Lego Space Shuttle model was constructed by visitors at Kennedy Space Center. 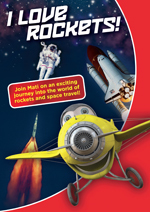 The U.S. Post Office has released several postage issues that depict the Space Shuttle. The first such stamps were issued in 1981, and are on display at the National Postal Museum. Space Shuttle Pictures and Space Shuttle for Sale.